Eating clean and exercising should be built into your life no matter what else is going on. If you forget this, you will fall back into your old ways, gain all your weight back and look back and wonder….what happened? Take care of YOU and don’t lose yourself. I think we all remember when Oprah Winfrey revealed that she had thyroid disease and that it has caused her weight problems throughout the years. There are two types of thyroid issues…hyperthyroidism (excessive) and hypothyroidism (underactive). Here is a more detailed explanation from bodybuilding.com. Hypothyroidism is a condition that occurs when T4 levels drop and the body begins a metabolic slow down. Hypothyroidism was first diagnosed in the late nineteenth century when physicians observed swelling of the hands, face, feet, and tissues around the eyes after surgically removing the thyroid gland from patients. The syndrome was called myxedema and corresponds with the absence of thyroid hormones. The term myxedema is still used today and is often associated with a severe lack of thyroid hormone that often leads to coma. Other common terms used in discussing hypothyroidism are autoimmune disease and Hashimoto’s thyroiditis. Both of these ailments result in a less than fully functioning thyroid gland. Hypothyroidism is usually progressive and irreversible, but today’s treatment schedules are very successful and allow for full, normal living. Combined with the symptoms listed below in the table, a rising TSH level is a good indicator of a hypothyroid condition. There are some unique risk factors associated with hypothyroidism. There are indications that individuals with ovarian failure, sleep apnea, premature gray hair and left-handedness are more likely to suffer from hypothyroidism. Subclinical hypothyroidism is a more recent term used to identify increasing TSH levels and declining T4 levels. Blood tests for T4 levels can still be normal and early symptoms of hypothyroidism may be exhibited. Research is finding that subclinical hypothyroidism is very common (affecting about 10 million Americans). Fortunately, subclinical hypothyroidism does not often progress to the full-blown disorder in most people. However, some evidence suggests that even modest abnormal thyroid hormone levels may do some damage. Hyperthyroidism, also known as thyrotoxicosis, is a clinical condition caused by excess quantities of thyroid hormone in the body. The condition may be caused by over production by the thyroid gland or the pituitary gland releasing excessive TSH. The excess of hormones can cause heat intolerance, increased energy, difficulty sleeping, diarrhea and anxiety and other symptoms as listed in the table. Factitious hyperthyroidism is another hyperthyroid condition. It is associated with ingestion of excessive amounts of thyroid hormone. Thyroid hormone preparations have been available for over a century and taking excess prescription or glandular mixtures can also cause hyperthyroid conditions. How Do You Get Graves’ Disease? Graves’ Disease is a type of autoimmune disease in which the immune system over stimulates the thyroid gland, causing hyperthyroidism. Over-activity of the thyroid gland is also sometimes called “diffuse toxic goiter.”The thyroid gland helps set the rate of metabolism (the rate at which the body uses energy), and when it is over-stimulated, it produces more thyroid hormones than the body needs. High levels of thyroid hormones can cause difficult side effects.This is an extremely rare disease that tends to affect women over the age of 20. The incidence is about 5 in 10,000 people. This is a condition that bodybuilders can fall into when taking thyroid hormones. If there is a concern that you might have a underactive or overactive thyroid, you should get tested by your doctor…do no self diagnose. These conditions are not a life sentence to be overweight. With medication and a change in diet, you can be just as healthy and fit as the next person. Did you know that Jilliam Michaels was diagnosed with hypothyroidism when she was 30 years old? She attributes the onset to her unhealthy eating habits and certain hormonal medications she was taking. Ladies, anytime we put hormones in our bodies that are not natural, we can expect some type of side effect. It might not appear quickly but after years, it make take its toll. This includes birth control pills or any alteration to our menstrual cycle…our bodies were meant to shed each month…just something for you to keep in mind. Hormones are as equally important in weight loss as are diet changes and exercise. I highly recommend the Jillian Michaels book “Master Your Metabolism.” She really breaks it down and all of the information is reasearch based and scientifically proven. Certain foods can help or hurt your thyroid levels. Check out this information below. With a little change and persistence you can live a normal and healthy life! Coconut oil also supports proper thyroid function as it slightly stimulates thyroid hormone production and the metabolism. In this way, wise incorporation of coconut oil into the diet is thought to support thyroid health and help sufferers of hypothyroidism to lose weight. Coconut oil may also help to reduce cholesterol in hypothyroid patients as thyroid suppression in and of itself raises blood cholesterol levels. Coconut oil is largely comprised of saturated fat and saturated fat promotes thyroid function. Shellfish, like sea vegetables, are naturally rich in iodine – the nutrient that is critically important to thyroid function as iodine molecules are used in the production of thyroid hormones. Soy is very goitrogenic. A strong suppressor of thyroid hormones, some research indicates that soy may even be more effective in thyroid suppression than anti-thyroid drugs. Don’t forget that soy is a potent food, and that while sufferers of hyperthyroidism might welcome soy’s thyroid-suppressing effects, take care to eat soy in its fermented state in foods like tempeh and miso as soy also contains antinutrients like phytic acid which impair the body’s overall ability to absorb many nutrients. Millet, like cruciferous vegetables, contains goitrogens and interferes with iodine uptake. Cooking millet, as well as goitrogen-rich cruciferous vegetables, may mitigate its antithyroid effects to some degree. Recent research into autoimmune diseases and autoimmune thyroid disease in particular indicates that there’s a strong connection between celiac disease and thyroid disease. Indeed, study published in Digestive Diseases & Science indicates that sufferers of autoimmune thyroid disease have roughly a 400% greater chance of also suffering from celiac disease than control groups. Moreover, some research indicates that after 3-6 months on a gluten-free diet, those pesky anti-thyroid antibodies virtually disappear. That’s a powerful case to remove wheat, barley and other gluten-containing grains from your diet if you suffer from any form of autoimmune thyroid disease. Coffee is simultaneously stimulating and goitrogenic which spell trouble for both hypo- and hyperthyroid sufferers. As a strong stimulant, it can wreak havoc on those suffering from hyperthyroidism as that added stimulation is the very last thing they need. Moreover, for those suffering from hyperthyroidism, coffee also interferes with iodine uptake and thus may inhibit the formation of thyroid hormones. Bad news for everyone. As with everything, if you suffer from thyroid disease or suspect you do, consult first with a physician and have that physician run the full panel of thyroid tests. If your thyroid disease is found to be severe, work with an endocrinologist and a complementary physician of naturopathy or integrative medicine. Remember, just because you suffer from hypothyroidism that’s not adequate cause to overeat iodine-rich foods; likewise, if you suffer from hyperthyroidism, that’s not adequate cause to overeat soy-rich foods as overeating any food can actually worsen the issue. Lastly, take solace in the natural, wholesome beauty of well-composed dishes. Consider how miso (goitrogenic) is paired with seaweed and dashi (iodine-rich). Or take a look at the way fresh seafood (iodine rich) is paired with pickled daikon (goitrogenic). Once you’ve achieved euthyroid status, eat complementary foods. A diet for hypothyroidism should include whole foods rich in iodine, niacin, riboflavin, zinc, as well as vitamins B6, C, and E. These nutrients naturally support proper thyroid functions as well as overall good health and vitality. You don’t need to hire a nutritionist to create your personal meal plans in your weight loss journey. Though we don’t have the technical expertise that a doctor has, we can do enough research to make our weight loss successful. Here are a list of some websites and books that you can use to learn more about how to eat properly for health and for weight loss. www.caloriecounter.com CalorieCount.com is a free online resource for those who want to live a healthy lifestyle. At no cost whatsoever, you can use Calorie Count to look up Nutrition Facts food labels to find nutrition data for more than 220,000 foods. Members use Calorie Count as an online diet program, a nutrition coach, and a workout partner. Your personalized CalorieCount.com account provides a food journal, exercise log, a weight tracker, nutrition data, and diet analysis, all customized to your personal goals. By seeing your calorie requirements, daily calorie count, nutrition analysis, and weight loss progress, you can get the weight loss results or maintain the fit and healthy body you already have. In addition to the helpful diet and exercise tools, there is also an online community of 2.5 million members awaiting your unique story on the path to better health. www.fitday.com Get your free online diet journal and start tracking your foods, exercises, weight loss, and goals. Join over 5.1 Million FitDay members using our site to take control of their diet and lose weight. www.eatcleandiet.com Eating Clean is not a fad; it’s a way of life. When you Eat Clean your body will react by losing weight if you need to lose, maintaining a healthy weight if that’s where you are, and even gaining weight if you are too skinny. But regardless of whether you want to lose, maintain or gain, you will feel better than you ever have before. This site provides recipes and an online community that helps you stick to your goals. www.foodfacts.com This site tells you exactly what is in your food. You may be surprised at the ingredients. Provides sample meal plans and guidelines for the types of foods that you should be eating. There are also clean versions of your favorite not so healthy meals included. Master Your Metabolism: Jillian Michaels knows her stuff. 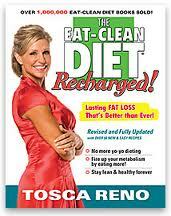 In this book, you will learn about how important hormones are and how we trash them everyday by eating unhealthy. These are only a few resources….more to come! 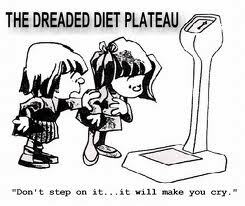 We all have heard about the dreaded plateau. In my weight loss journey there were times when my weight was stagnant but it never lasted for more than 2 weeks. I guess I was lucky or maybe it was because I kept a very close watch on it. I weighed myself every week and if the numbers stopped moving, I got busy changing my plan. If you are “stuck” that means you have to change. Change your workout, change the foods you eat, or anything else that might be getting in the way. It really works! Some nutritionists recommend zig-zagging your calories. That means you eat a different number of calories each day. I found a great website that allows you to put in your weight, height, and the number of days you workout, and it calculates the number of calories you can eat each day. It’s awesome and you can use the higher calorie days as your “cheat meal” days. This site uses the Mifflin-St. Jeor method of calculating your calorie needs. The Calorie Needs Calculator currently uses the formula proposed by MD Mifflin and ST St Jeor1. As recent as 2005, the ADA (American Dietetic Association) published a comparison of various equations2. The Mifflin-St Jeor was found to be the most accurate. *Calorie cycling provides same amount of calories per week, but ‘tricks’ your body by constantly changing daily calories. This helps to prevent or break plateaus. Guideline only. Too many people in this world are “realists.” They expect the worst, give the worst, and never push beyond where they think they can go. Why do we do this to ourselves? I think that when God or the higher spirit, whatever you want to call it, made us, there were no limits placed on what we could do as human beings. We have done that to ourselves. Society tells us all of these negative things and everyone is just getting by. Why don’t you think about challenging yourself and go for your dream? Rephel and I were taking a walk yesterday through the neighborhood and there was this one house that was for sale. It was a $500,000 house and the one that you dream about when you are a little girl. As an adult, your mind tells you, “you will never have that house…you are 30 years old and have no money saved…how can you ever get that?” If you keep listening to that voice, that is just where you will end up for the rest of your life. 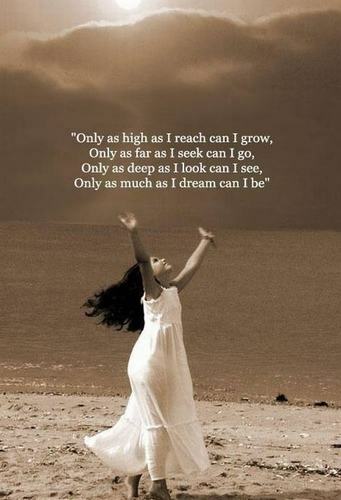 Never dreaming or hoping for anything greater. When I was at the gym this morning I was skimming through Essence magazine. (I can’t stand steady state cardio on the elliptical or stairclimber but I do it because it is a necessary evil, so sometimes I will have a magazine to look at…even if it is the same page the whole time!) A trainer was discussing goals and she said that we need to shoot past the realistic. If we just stick with the “realistic” goals we often sell ourselves short and have a “just in case I don’t make it” attitude. If we set our goals high above where we thought we could ever be it makes us work much harder. Go figure! When you are exercising, train like an athlete. Develop a professional mind-set, create a plan and stick to it! Are you not sick and tired of being stuck in your rut and never getting to where you want to be? Stop acting like that and get out there are do the work! You can do it but only if you have a plan, train like an athlete, and stick with it. You deserve it don’t you?